Come to a Bloomington, Illinois bed and breakfast and experience all that this area has to offer. Bloomington is located in the Central Region of Illinois. This area has a diverse representation of history, arts, and nature. When you enjoy Bloomington lodging, there is as much to do and see as you wish. Bloomington has several museums and historic sites, including the David Davis Mansion State Historic Site, Ewing Cultural Center, Mclean County Museum of History, and Prairie Aviation Museum. The Bloomington Center for the Performing Arts is host to an annual season of nationally known touring artists and home to 20 area performing arts ensembles. Over 400 community events take place here each year. For those who love the outdoors, be sure to visit the Genevieve Green Gardens and the Miller Park Zoo. While visiting Bloomington, guests can also enjoy the vibrant nightlife, wonderful shopping, and diverse dining options that this area has to offer. 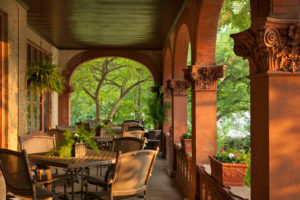 As you look into Bloomington, IL hotels, consider the alternative of a bed and breakfast, and let the Illinois Bed and Breakfast Association help you find the perfect one for your next getaway.